Sega Master Force - Issue 1 - The Kremlin in the Works - Articles - SMS Power! Armed only with his trusty Bic Automatic and suitably attired in dodgy trench coat and dark glasses, comrade Paul Wooding is hot on the trail of an international organization operating under the name of 'The Kremlin'. Does he find any reds under the bed and, if so, what are they doing there? So just who are The Kremlin? I knew virtually nothing about them until recently, yet I was familiar with all of their products, prompting a very embarrassing 'Oh, was that you?' reply (sorry, lads). The Kremlin have been around for just over three years, and in that time they've been responsible for a multitude of games over a wide range of formats. 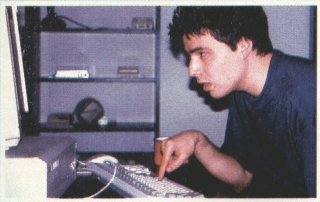 They started off programming for the big 16-bit computers (Amiga and Atari ST) then gradually broadened their field until they were programming games for eight different systems. The emphasis has switched away from computers and The Kremlin look likely to take to the Sega games market by storm, as they're totally committed to producing games over all formats. If you doubt their intentions, take a look at the number of staff employed, 1990-93. 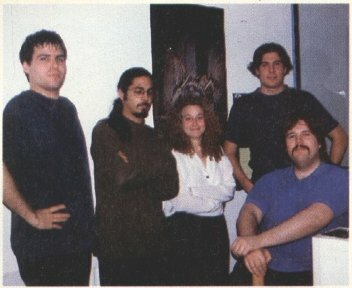 When they first started, they had four full-time staff, consisting of three programmers and one artist. Over the past few years, they've built up to the 27 people they now employ. 22 of them programmers and artists! They have an in-house musician and a 24-track recording studio, complete with instruments! 'Aha!' I thought on arrival at Domark's West London HQ, 'they've cunningly disguised the building as an NCP car park. Very sneaky!' But it didn't fool me, and in no time at all, I was sitting in the reception area drinking mineral water - it must have been Putney's hottest day in years. I just had time to gulp down the last dregs before I was shepherded down a flight of stairs where I located a rather imposing door with a plaque bolted to it. As I cleared away the dust that covered the sign, a word began to emerge. I rubbed harder until all became clear. The word was 'GENTS'. 'Do you want to go to the loo before you meet the team?' asked a rather bemused Joanne, Domark's latest PR recruit. 'Er. yeah, I'll be out in a minute,' I stammered as I pushed open the door. Oh well, only 59 seconds to kill! On leaving the toilet, a gleaming plaque caught my eye, indicating the all-new offices of The Kremlin, one of Britain's top programming teams - and about time, too! So just who ore The Kremlin, and what are they doing in Domark's basement? 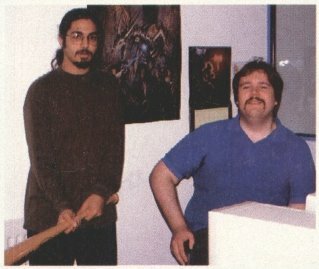 They're an established programming team who've gone 'in-house' and share residences with the software company who market their games. It's a kind of Big Brother relationship: they're free to create games, while Domark look after their commercial interests by marketing the games to the public. This relationship has worked well in the past, with titles like James Bond, Super Space Invaders and Prince Of Persia all going down a bomb on the Master System, as well as the MD and GG. Imagine these fearsome fellows walking down Putney high street waving their bats about. Well that's the sight that greeted me as I hunted for Domark headquaters! Only the most talented designers and programmers get to work for Domark. The entry test is incredibly tough and here we see two of the applicants actually attempting to spell their own names. 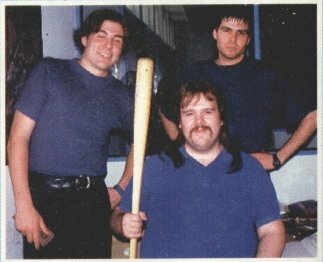 Who's that fellow with the bat? Why is that man smiling and just what kind of a lousy caption is this?! The general consensus around the SEGA MASTER FORCE office is that you can't fit Desert Strike onto an 8-bit machine, no way, no how. Michael Carr, one of the MS programmers, disagrees with that statement completely. He's well proud of what he's managed to get out of the humble MS. and so he should be! 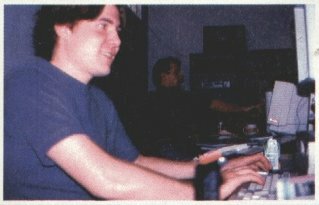 Michael, together with producer Darren Anderson, have done their level best to capture the feel of the original MD game and. along with the two graphic artists, Matt Hicks and Mike Adams (who designed all the sprites and backgrounds), they've produced virtually an exact replica of the 16-bit original. I asked Michael what he'd left out from the 16-bit version. 'Not a lot,' came the reply. 'Obviously, some things had to give, but all in all you'd have to look at the game pretty closely to notice the omissions. A personal favourite of our beloved Deputy Ed and a fantastic MS game. Faultless graphics, smooth animation and brilliant sound FX and tunes, it just oozes gameplay. In my mind, this is their best MS product to date, and the mark we awarded it in SGEA FORCE reflects that; we gave it a whopping 94% in Issue 7. This time the lads turned themselves towards an arcade conversion and again came up with the goods! The graphics are good, sounds are good and the playability just too addictive, made doubly so by the inclusion of a two-player mode. Everyone in the office liked this one and it scored a mightily impressive 87% in SEGA FORCE! Again proving their versatility, they attempted to convert the yuppies' favourite board game to the MS. How did they fare? Very well (honest, they don't bribe us, these games are genuinely good!). They captured the fun of the board game perfectly. 007 gets the Kremlin touch as Britain's favourite spy gets his own platform game. Boasting silky-smooth animation and big, bright graphics, James Bond looks good and plays like a dream. It's platform action at it's best and we all agreed it should get a high mark. How's 84% grab ya!? That means the first four Kremlin MS games all scored over 80%! Now that's good going. Oh dear, how sad, never mind. No matter how many good games you produce, you're always gonna have a bad egg in the bunch, and this is The Kremlin's. The fighters are horrendously small, the action's boring and the whole game could be completed on Hard level using one move! Having said that, the graphics between games are stunning and the end-of-game sequence includes digitised pics of the programmers. We didn't review this one but I don't think it would've climbed much above 40%. Better luck next time lads! I managed to get a good 30 minutes on the game, and to say I was impressed is an understatement of enormous magnitude. Comments such as 'wow! ', 'cor!' and 'how did you do that?!' emanated from the desk we huddled round. I must admit to being truly amazed by what the guys at The Kremlin have managed to get out of the Master System. The plot's the same as the MD version. You're a hot-shot pilot in the American Air Corp who's out to stop General Kilbaba from invading a wealthy oil-producing country in the Middle East. To defeat the mad General and his tyrannical troops, you have to complete four campaigns consisting of 27 missions. Every time you complete a campaign, you're awarded a password which enables you to re-start on the last campaign reached. If you're familiar with the original, the first thing that'll hit you about the MS version is the amount of stuff they've crammed in. One worry a lot of people had was that you'd only be able to use two weapons, due to joypad limitations. No fear! You've still got the three weapons to use; guns. Hydras and Hellfire missiles (Hellfires are launched by pressing buttons and simultaneously). You've got to contend with fuel and armour problems as well as your ammo running low, so it retains that frenetic excitement as you try to combine your missions with the never-ending search for supplies. Despite all of the above, the overriding detail that struck me was the speed. The action starts off at a blistering pace as the helicopter glides smoothly around the screen; very impressive for the Master System, which usually slows down to a snail's pace when there's a lot going on. On the gameplay front, it promises to be the toughest version, which is no bad thing since the MD game was a bit easy. No such luck here: MS Desert Strike starts hard and stays that way, providing a tough challenge and great value for money. Now, if all this talk of Desert Strike is getting any Game Gear owners jealous, keep that green-eyed monster at bay because the handheld version is due out in September. The same date, indeed, which has been set for the MS version. GG Desert Strike is, at time of writing, some way behind the MS version, but I'm assured it'll knock your socks off when it's finished. Remember how good Prince Of Persia was? Expect more of the same. The Kremlin are going from strength to strength and they've some truly stunning releases lined up for later this year - and right through the next. They're actively involved in recruiting and are pioneering a scheme that links them with one of Britain's top universities to run Degree-level courses for qualifying programmers, designers and musicians. So. if you're leaving school and are interested in joining a premier programming team, this may be your ticket into the industry, and stardom! The Kremlin are also expanding their status worldwide They already have an office in San Mateo. California, and are to open one in France shortly. Russell Ferrier, The Kremlin's General Manager, is confident the team are going to be a leading force in the Sega console games market: 'We've got some great stuff lined up for all the Sega systems.' chirped Mr Ferrier. If it's anything like their current crop of games, us MS owners should be in for a very merry Christmas and a gamingly good New Year.